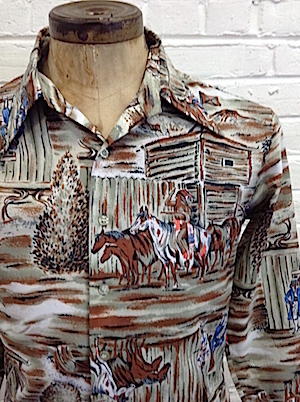 Mens vintage 1970s disco shirt. 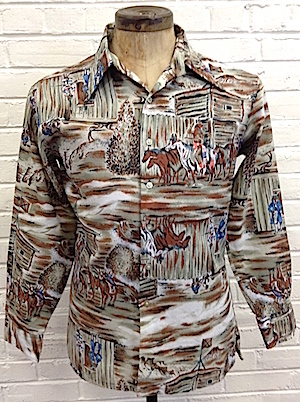 This wild disco shirt features an illustrated scene with Native Americans approaching a colonial fortress on horseback! The image comes in taupe, reddish brown, white, red, blue and black. Has a super wide & pointy disco era collar. Closes in the front with pearly white buttons with two more on each cuff. Shirt has a tapered hem with small slits on either side. Tagged by Marco. 100% polyester. Chest: 43" LARGE. Shirt does not have any stretch to it.